The summer months mean more growth in the gardens and therefore more cleaning and weed pulling. Grass and weeds take root amongst the rocks and the monks have to head out and clean things up. 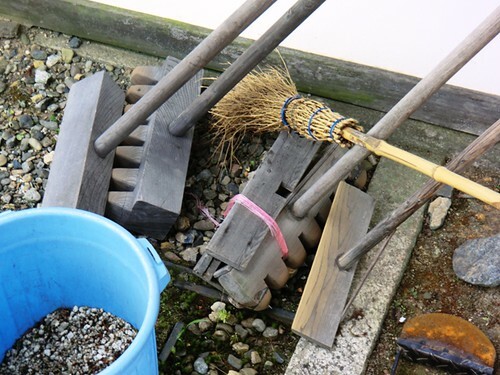 Of course after walking on the rocks to take care of the weed pulling, next is re-raking the rocks into shape. The pond also got a little bit of sprucing up by way of a net used to clean up some debris around the edges of the water. Here are the completed doors I showed you in this post back in early June. The new shōji doors were installed just a few days after that post. The glass panes and sliding panels that can be lowered to cover them are very useful and much more convenient than the previous doors. The old doors were installed the opposite direction, the flat paper-covered side faced into the room and the side with the wood slats faced out. I was surprised to see that with the new doors it was different, but it turns out that the way the doors are now is the more correct style for the current setup of the area. In the past the temple shop occupied the open space that is now in front of this room. Since then, the temple shop has been relocated to further within Goten. Shōji doors are meant to be installed so that it is easy to open and close for the main people using the doors, in this case people who work at the temple are more likely to be within the room going out, so having the slats on the inside makes the doors easier to open. More maintenance in Goten recently! The other day there was a fitting for a new set of shōji doors on the little room at the entrance of Goten. 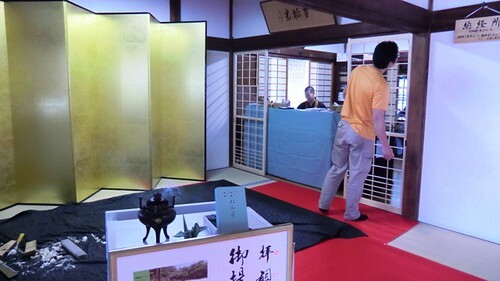 (This is where visitors bring their stamp books to get their commemorative stamps from their visit to Ninna-ji.) The new doors will have a larger and higher glass pane so that it will make it easier for visitors and the people working in the room to see each other. 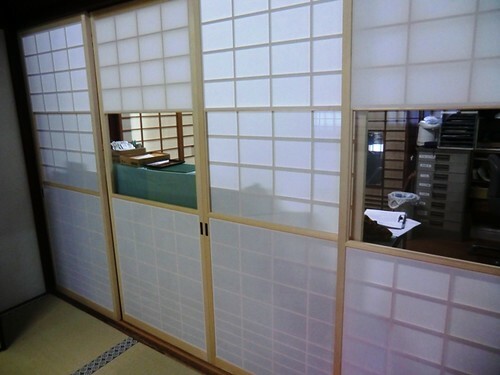 The glass panes have sliding shōji panels that can be left in place making the doors opaque or can be moved up to reveal the translucent glass pane. 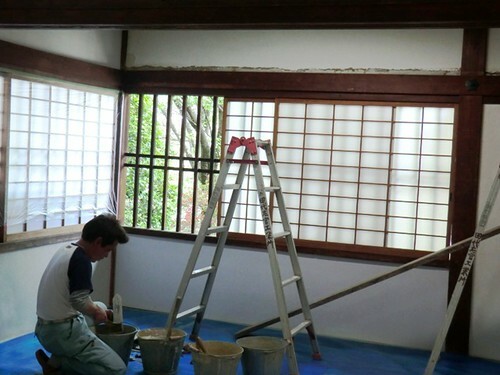 The craftsman making the doors will be back another day soon with the completed product, as you can see in these pictures when he came for the fitting the Japanese paper that is so characteristic of shōji doors had yet to be applied. The other day the North Garden got spruced up a bit. 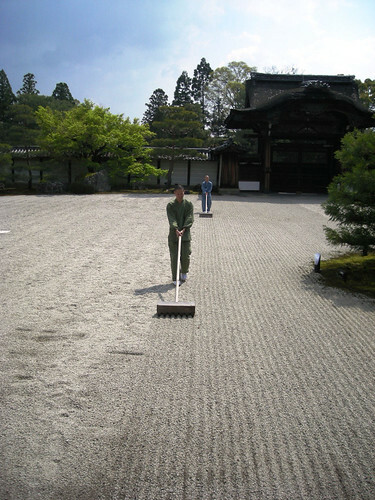 The noise of a leaf blower was quite a change from the usual tranquil atmosphere of the garden, but since the temple is open 365 days a year there is no choice but to take care of these jobs when visitors are present. 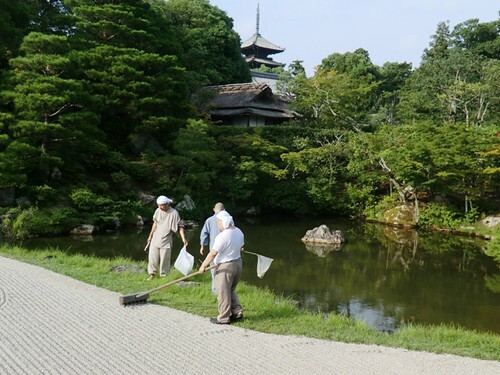 During the cleaning the garden may not have had the same meditative quality as it always does, but I think that seeing some of the work that goes into maintaining the temple is valuable experience, too! When you enter Goten, usually there is a beautiful gold folding screen to your left, but yesterday it was moved temporarily for some repairs to the wall behind it. 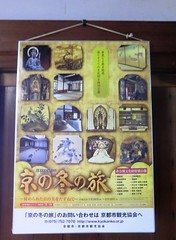 Goten is approaching 100 years old, upkeep of the building is very important! 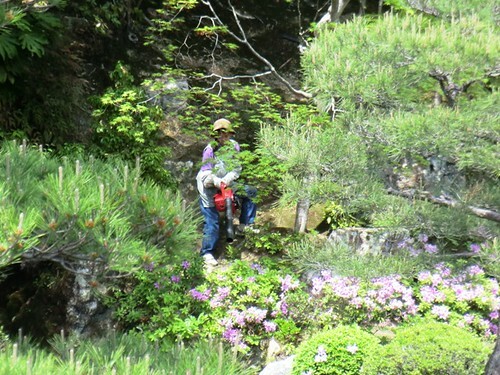 I thought that the walls were the same as those in old Japanese houses, but it turns out that someone trained in repairs for residences is not sufficiently trained for working on walls like those in the palace area. 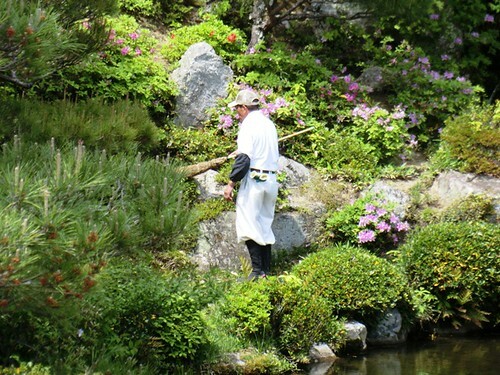 The man pictured above is a specialist in repairing walls in temples and shrines. With good weather the gardens usually hold up for a while without additional raking, but with the rain and an event held in the palace area recently the gravel in the South Garden was a mess. Apparently it takes a lot of focus to make sure the lines don’t start curving this way and that. I’d be interested in giving it a try… but only when the weather is nice!